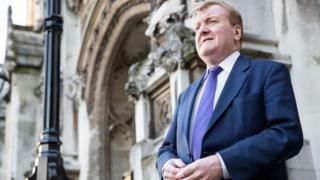 A new community building in Fort William has been named after former MP for Ross, Skye and Lochaber, Charles Kennedy, who died in 2015. The Charles Kennedy Building is a former school. Highland Council is regenerating the large B-listed building, which has been vacant for 25 years, in phases to create public services offices. Mr Kennedy, who was leader of the Lib Dems between 1999 and 2006, died at his home in Caol near Fort William. He was MP for Ross, Skye and Lochaber before losing the seat in the 2015 election. Highland councillor Blair Allan, who proposed the name for the new offices, said: "This project is a significant development for the town and brings back to life a much loved building close to many people's hearts. "Charles Kennedy was educated in Fort William and throughout his career was hard working and dedicated to the communities he represented. "I think it is very fitting that the new offices which will serve the local community well for many years to come be named in his honour and I would like to thank his family for giving their support."